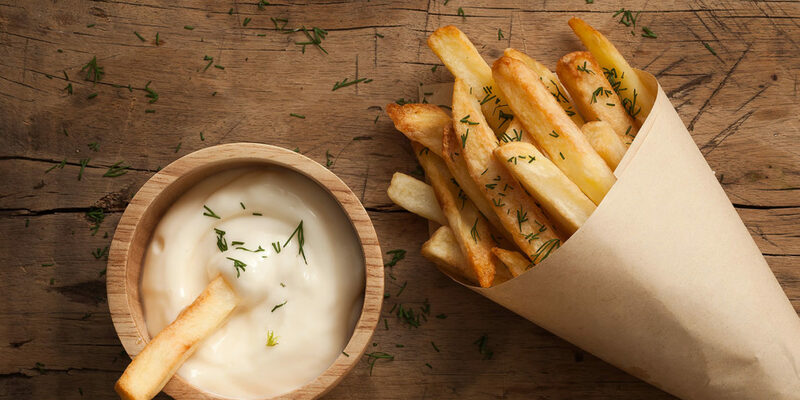 Hot, crispy French fries…what can be better? Well, maybe with some good sauces. Find a few below, along with a fry recipe, from WSU Executive Chef Jamie Callison. Fill a large bowl with water, and kosher salt, and soak potatoes, for at least 30 minutes up to 24 hours. This will help remove the excess starch from the potatoes and keep them from oxidizing. Heat a heavy stock pot fitted with a deep-fry thermometer with oil to 325 degrees F. Or a deep fat fryer Remove potatoes from the water, and pat dry to remove excess water. Add 2 handfuls of dry potatoes to hot oil. There should be at least 1-inch of oil above the potatoes. Par cook until potatoes are light brown, 5 to 7 minutes. Remove potatoes, gently shaking off excess oil and let drain on rack. Raise heat of oil to 350 degrees F.
Cook potatoes again, 2 handfuls at a time, until golden brown, about 2 minutes. Remove from oil, shake off excess oil, and season lightly in a bowl with salt and pepper. Stir all the ingredients together until well blended. Chill thoroughly before serving. After all half and half is added bring to the boiling point and then turn down to a simmer stirring with a wire whisk. Cook for about 15 minutes on LOW HEAT and then add a little of the cheese at a time stirring constantly. saving some of the cheese for the top. Once the cheese sauce is smooth season with salt, pepper, and ground nutmeg . You may need more or less of the seasoning depending on the salt content of the cheese. Bake at 300 degrees until hot and cheese is melted. What are your favorite fry sauces? Let us know and we’ll include them on this page.